Heat detector is a StackApp whose goal is to catch offensive, rude, snarky comments, and comments that leads to abusive content (offensive, spam posts, or previous offensive comments). It is running a bot that queries comments from the Stack Exchange API and retrieves all comments posted on Stack Overflow. The automatic detection is based on a mix of regular expressions and NLP (Natural Language Processing). When a comment is classified as "rude" by the system, it is sent in a dedicated chat room for manual review and feedback. To avoid storing comments in chat transcript (unearth buried fights), the comment is automatically deleted from chat before the timeout (which is a 2 minute window). The bot also has a test function and a report function, that enables the possibility to test different comments and to train the classifiers on uncaught content. The comments API is queried every 1.5 to 3 minutes depending on the traffic, the objective being to get all last comments within 1 page result (max 100 comments), to reduce API calls to a minimum. All comments are processed both by RegEx and machine learning algorithms (NLP) and they all contributes to a final score. If the score is above a defined threshold then the comment is send to chat. Before applying a RegEx detection, the comment is pre-processed, removing usernames, HTML tags, and repetitive characters. In the same way, before NLP classification, code blocks, links, and non normal ASCII characters are removed. The RegEx system is divided in three external text files; high, medium, and low scoring RegEx. Currently 2 different NLP systems are used. On the basis of the predicated value the score is increased. Currently the feed contains 2000 good Stack Overflow comments and 2000 (1000 Stack Overflow, 1000 Twitter) bad comments. The settings have been chosen on the basis of cross validation and classification result on the training set. Testing on the training set has correctly classified instances at 99.075%. Testing on training set has correctly classified instances at 99.823%, with 7 comments out of 4000 not classified correctly. 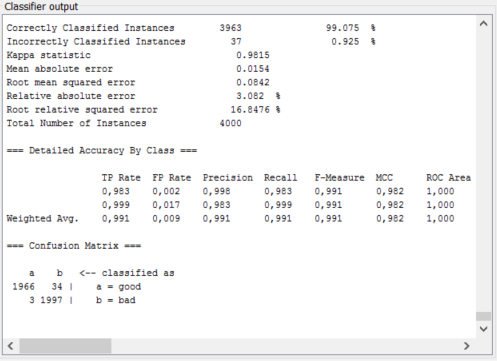 Other classifiers as J48, SMO, and SGDText have been tested, but didn't provide good enough results. The bot runs under the user Queen, which is the same as SOCVFinder. The main reason for this is to leverage calls to the comments API, since SOCVFinder is already querying it to fetch possible duplicates. The bot is present in the SOBotics chat room. This StackApp is currently in testing phase, to understand correct RegEx and especially to improve feed, including new bad Stack Overflow comments replacing the Twitter feed comments. The objective is to run on 3000 good/bad only Stack Overflow comments. Browse other questions tagged app api-v2.2 comments .